The sustainable design community has recently turned its attention to the issue of “healthy buildings.” While this term has become common, it hasn’t been well defined. Following Atelier Ten tradition, we decided to add some rigor to this discussion. We embarked on a year-long research project to study the literature, define our approach, and apply our creativity to the critical issue of health. We committed ourselves to three key principles: protect occupant health, promote occupant wellness, and prevent environmental harm. Protecting occupant health means removing active hazards such as toxins in materials, air, and water. Promoting wellness goes much further: it means creating spaces that are not just healthy but comfortable and delightful; spaces that support effective learning, working, and playing. Preventing environmental harm is the basis of all of our work. We believe a healthy building must improve environmental health as much as human health, by addressing on- and off-site ecological impacts. A healthy building must also go beyond its occupants to improve the health of everyone associated with the building down the supply chain, from construction workers to product manufacturers. Towards this end, we identified seven design issues that are critical for healthy buildings: air quality; water quality; material assessment; lighting design; access to daylight and views; comfort, including visual, thermal, acoustic, and ergonomic comfort; and active design. We have deep experience in many of these topics based on decades of work in the areas of daylight design, visual and thermal comfort, ventilation system design, and lighting design. Other topics are emerging based on current research, such as material assessment. We have created a new protocol for assessing health hazards in building materials based on the newest scientific literature and using emerging tools such as Health Product Declarations (HPDs) and the Declare program. We have long believed that health and sustainability are interconnected, and both must be achieved together. Daylight design is one clear example. 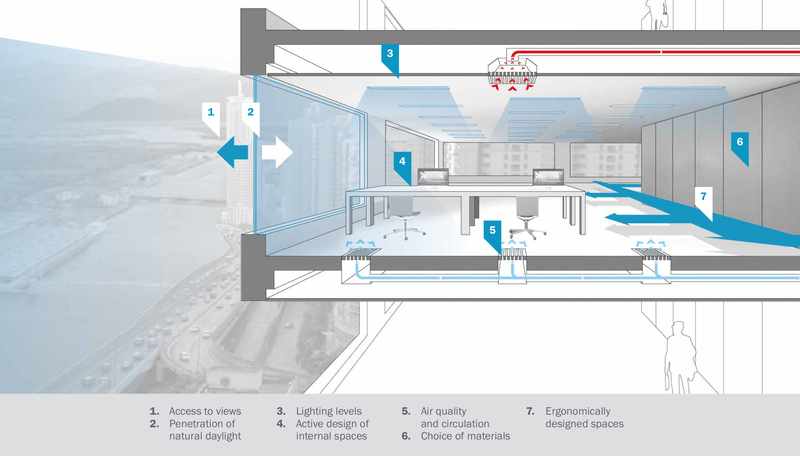 For the last two decades there has been a strong push for more daylight in buildings. Unfortunately this often led to over-glazed buildings where visual comfort was neglected. Occupants therefore took it upon themselves to make their environment comfortable: they put up blinds, taped paper to the glass, even used umbrellas as parasols to shade their workstations. All of these ad-hoc alterations blocked daylight, so the lights stayed on and the original purpose of the design – access to daylight and lighting energy savings – was undercut. Lesson learned: you must design buildings for both energy savings and occupant wellness, or you’ll end up with neither. We can tackle these interconnected daylight and comfort challenges. We understand the interplay of space planning, building skin, interior design, lighting design, and occupant behaviour. We can analyze daylight access, energy savings, and visual comfort with the right level of detail at each phase of design. We can design alongside architects to optimize their facades, while communicating the benefits of better design to owners and occupants. Material assessment shows the health-sustainable link in a different way. Most people are shocked to learn how few chemical components of building products are regulated. In the United States, of the 80,000 registered chemicals in the building product industry, only five are regulated. Manufacturers often don’t know the full list of chemical compounds in their products, how they are made, or what harm they pose. These unregulated chemicals may pose health hazards alongside ecological ones, and no one has asked manufacturers to prove the safety of their products – to people or to the environment. This is an ‘environmental justice’ issue as well, because blue-collar communities centered around product manufacturing are exposed continually to these health hazards. A precautionary approach is therefore warranted: let’s endeavor to avoid chemical hazards wherever possible, and not wait for industry to definitely prove harm. By finding alternative materials free from “red list” chemicals, we will reduce chemical hazards for occupants, manufacturers, and construction workers. We will eliminate the incentive to manufacture and dispose of these chemicals, which will limit their release into the natural environment. We can do better. We can assess materials for chemical hazards and align our material choices with the values of each client. We can find alternative products, and in doing so improve the product library for each of our clients. We can use material transparency efforts to educate product manufacturers and advocate for market transformation. Based on this work, we are now at the forefront of improving the health of people and communities in the built environment through innovative design strategies. Our team includes experts in toxicology, industrial hygiene, environmental health, building science, lighting design, environmental management, and building systems engineering who understand the relationship between the built environment and human health. We are committed to solutions that protect occupant health, promote occupant wellness, and prevent environmental harm. Join us.